mommy bytes: Are You Boggled? I'm definitely no word whiz as being an engineer doesn't lend itself to being a wordsmith (disregard the mommy blogging, BlogHer and Autoweek gigs for now). But when it comes to word finding puzzles, it's more about logic and pattern recognition than vocabulary knowledge. It all started innocently enough when Dova asked me to help her with the Webkinz game Eager Beaver Adventure Park. "Manures"? Is that the best I could do? She would get frustrated with the crushing blocks timed levels, so I started "helping" her out. I never made it past level 7 or so, but one day I finished the entire game. And then I did it again. 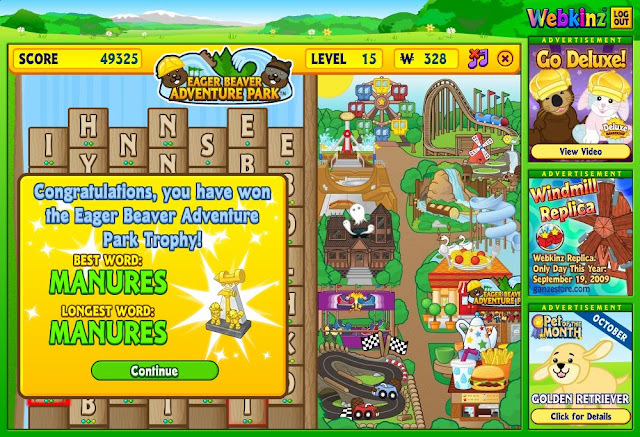 And I found myself addicted to "helping" her get Webkinz cash with this game and others (Cash Cow, Goober's Lab, Bamboo Break, variations on my favorite games of matching hearts, bejeweled and tetris, all feeding my need for stochasticity). I tried out Boggle iPhone on a free promotion last year. Granted, Quordy and Wurdle beat the official Hasbro game in the reviews, but they cost more than free. I was hooked again. And so was Adam. 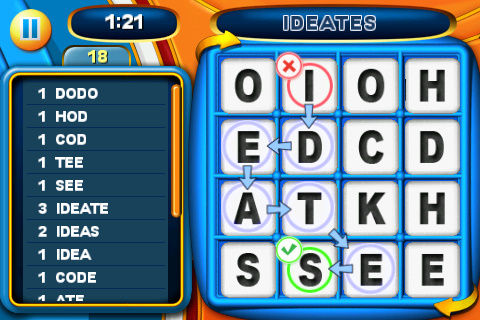 I even found a work-related word, "ideates", which sure beats "manures". The best part of the game is seeing the all the possible words that can be created with the board afterward. You do feel kinda stupid getting only 30-50 of the sometimes 200+ words, but you do start thinking in the serpentine paths and patterns that you hadn't seen before and improve with practice. It's also a great way too kill 3 minutes while you're in line. I might have to get this. I loved Boggle as a kid.